Here’s the thing: you didn’t go into teaching to become a millionaire overnight. Or if you did, hopefully you’re not a math teacher, because the numbers don’t stack up. There are tons of amazing reasons to pursue a career as an educator, and I couldn’t imagine myself doing anything else. Thankfully, there are also quite a few opportunities for teachers to increase their income. 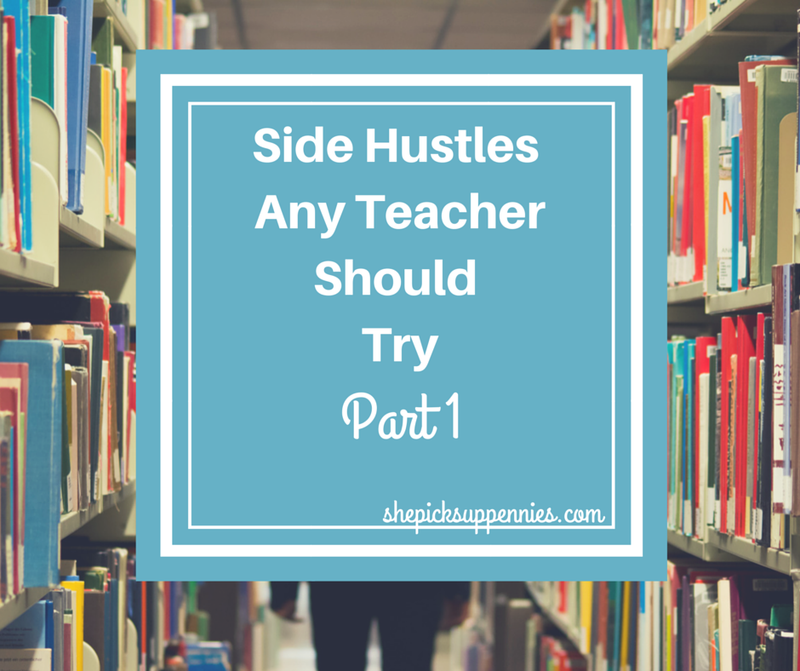 Read on to find out more about five side hustles for teachers. In my school, we are required to do fifteen minutes of morning supervision every day, plus an additional 30 minutes of outdoor supervision once a week. This supervision falls within our contractual routine teaching responsibilities, so there’s no extra dough to be made. However, some schools allow teachers to sign up for morning or after-school supervision and earn either hourly rates of $10-15/hour or small stipends. Unlike supervision, cafeteria duty does not fall within our regular teaching obligations at the middle and high-school level. Probably because we’re teachers, not lion tamers. I have coworkers who liken it to nature shows where viewers are treated to wildlife in their natural habitats. I actually happen to think cafeteria duty is a wonderful opportunity to connect with kiddos in authentic ways without worrying about sacrificing curriculum time, to build relationships with fellow lunchroom supervisors, and to get some fresh air. Plus, it’s a totally justifiable reason for me to pack PB&J every day. It won’t make me rich, but I earn about $10 per day for my time. Being a substitute teacher isn’t for the faint of heart. We can probably all recall a time from our childhoods when an otherwise typical student magically morphed into a monster when the sub started scrawling her name on the board. Fortunately, my school is fantastic. We have great students and equally wonderful staff members. As a result, students are mostly very well behaved for subs. While I have to sacrifice my plan period to do this, I can net $15 for filling in for a coworker who has to attend a meeting or has to leave the building unexpectedly. Coaching can bring in a pretty penny if you’re willing to put in the long hours, have an ability to teach the skills necessary to enjoy the sport, and don’t mind the rare occasional crying. * I personally do not coach due to a general lack of coordination and the unpredictable after-school hours. Practices run for an hour or two after school, but game days can eat up five or six hours of time several days a week. Another complaint I hear from new teachers is that it’s hard to land a coaching position. And they’re absolutely right. Still, if you have any interest in coaching, let your athletic director and administrators know. It doesn’t hurt to let the current coaching staff in on your interests, either. That way, when an opening does pop up, people will be sure to let you in on the interviews. These stipends can pull in anywhere from a couple hundred dollars to over a thousand dollars a season depending on the hours, season length, and amount of coaching staff. While clubs and intramurals do not pay as well as interscholastic sports, they require less time and often attract a different crowd of students. I run a literary magazine** that piques the interest of students who are great writers and other students who are just looking for a place to belong. And you know what? That’s just fine by me. Most schools offer intramural sports, environmental clubs, service organizations, and more. Often times, if students have an interest in creating a club or joining an intramural that isn’t currently offered, districts will approve their formation. You may have to wait a certain period of time before receiving a stipend for them, though. Since most of these activities only require half a dozen or so hours each week, most stipends bring in a few hundred dollars. I know, I know. Those of you who aren’t teachers had no idea how glamorous our side hustles could be. Who would pass up an opportunity to slip on errant jello and remind kids that grapes are for eating, not throwing? Don’t all run out to get your education degree. And those of you who are teachers are probably either smiling in recognition or sighing in exhaustion. Check back next week for more ways to earn extra income as a teacher. *I teach middle school. There’s lots of tears. And hormones. So Tell Me…Did any of these opportunities surprise you? How do teacher side hustles compare to other side hustles that you’re familiar with? This is totally a new world to me. I didn’t know teachers could have such side hustles within the school. I’ve never done any of those side hustles before, but it’s always great to know new information. Thanks for sharing! There are so many more! I should definitely come back to this post. Like any side hustle, though, they’re not always worth the time.